Our real estate office is open 6 days a week year round and are available by appointment on the day we close and after business hours for our customers convenience. We are dedicated to listing and selling customers property and we have a high success rate on the sale of all our real estate listings. We will give our best effort to serve the buyer and seller on every property. We List and Sell Our Listings for 4%. 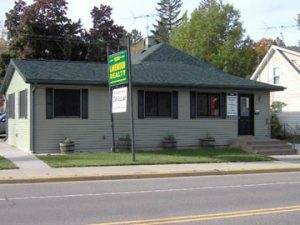 We are located in busy downtown Lakewood across the street from the Laona State Bank. Our real estate office is the oldest continuously operated real estate business in the Lakewood, Townsend and Mountain area. Patrick Bake started the business in the late 60’s and the doors to the current location were opened at that time. We know the area very well. Mike Tebo bought the Real Estate Business from Pat Bake and his wife Virginia “Sam” Bake in 1990 and had been running it with his son Tony Tebo until 2007 when he sold it to Tony. Tony is the full time Broker and is running the business to this day. When you stop in or call the Office you will be taken care of by someone how cares about your property and how the Real Estate Office is being run. Saturday – 9am to 1pm. Stop in or call for more information on any of the properties listed on this website.